You and I are not so different. I sat in my office today, mulling over recent dramatic events. I wasn't cursing my relatively good fortune, the privilege of getting to lead 30-40 people every week to push themselves past a breaking point, to see how far they could go in the game. I'd be a damned liar if I said I wasn't tickled to see that every week we had people giving 110% to see what remains of your empire crumble. It doesn't seem to matter that we fall asleep disassembling the building blocks of Supremus, beating back an army of orcs on the way to Teron, or that someone will always stand in some kind of fire. It doesn't matter that some days I can barely muster 23 people and hope that a couple more show up. Those are trivial matters of process and perseverance. What does matter is that every week, we hit the same spot, and make a little progress. Oh sure, some days are better than others. Some days we can swat half of Hyjal at best. Other days we are getting permits signed to set up home in the temple of Karabor, bulldozers at the ready. We've already ransacked much of your minion's belongings and are now just looking for the choicest bits. Those days, I grin ear-to-ear. And so it is that I was in my office today thinking about dramatic events, and how they couldn't phase even our little guild of individuals, when I thought, Is this what it was like for you? You were trapped for 10,000 years, a fact you have hardly kept hidden. 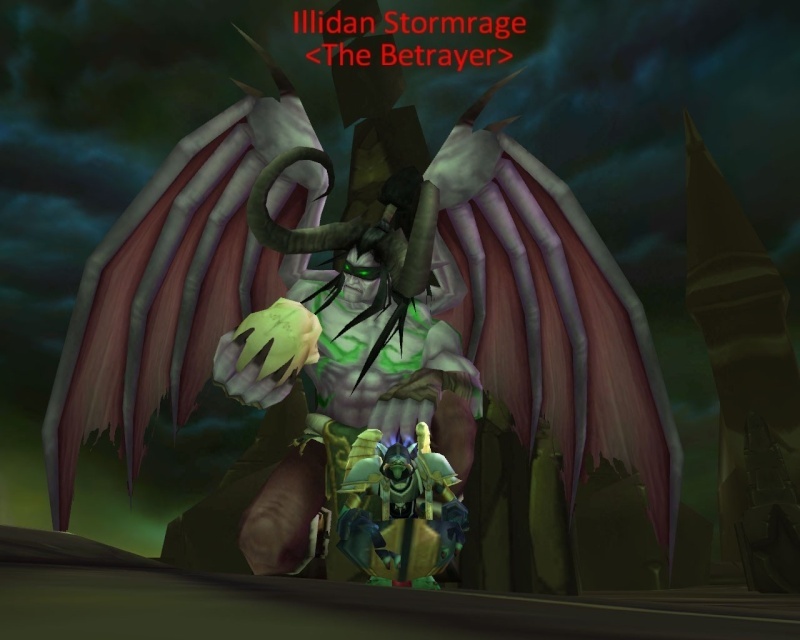 You eluded your jailor, attempted to flee the gaze of Kil'Jaeden, and found new allies in Lady Vashj and Kael'Thas. You tried with all of your might to prevent the rise of the current Lich King and nearly paid with your life. Now you are forced to lay siege on two fronts: The Burning Legion, which is coming to collect your head, and Shattrath, which contains the remnants of those you drove out of your current home. Your lieutenant Vashj is dead and Kael'Thas is clearly hiding while cavorting with the Legion, a clear betrayal of trust for what? More power? You are forced into a game of politics, an endless power struggle among those you keep close. However, in the end, it is the Betrayer who is the Betrayed. I find myself occasionally wondering how you would handle it. I deal with political issues, loot drama, group composition, and fair leadership. It's a mantle I gladly burden, but I can not just pick up a pair of swords and start cutting people open for 8,000 damage a swing to solve my problems! I would like to think that you at least respect the decisions I have made thus far, and think that had you done it again, you may have chosen the same paths I have. And in the end, respect is something I think we both can appreciate. The respect of those whom we lead is true mark of a great leader. I never claimed to be a great leader, and while at one point you may have been held in high esteem, it's clear how far you have fallen, resorting to fear to push your agenda. I'd like to think that those whom I lead respect me as much as I respect their contributions to the guild. Like you, it has not been an easy road for me. I've had a lot of struggle in trying to change perceptions, rebuild a fallen guild, and compete with some of the oldest PVE franchises in the game. I think they respect me, although occasional comments I hear make me think sometimes it's a respect born of fear, and I worry when I hear that. So it is with all of this nonsense that I sat here and thought to myself, You know what? You and I are not so different. Sure, I'm a troll, and you're a corrupted night elf. You have 6.7 million health and I have 9,000. I pity your lot in life and you pity that I would even challenge you. Of course there are the obvious differences, but deep down, are we really that different? We're both just leaders, in different parts of our careers, looking for a little respect and appreciation from our peers. Will we discover it? Amusingly enough, I think we'll find out at the same time.